This stool has sat being ugly for over a year now. I never knew how I wanted it to look, whether to paint it, or what colors. So I decided just to go to the fabric store and find what I liked that would match the wood legs. I tried to find a bench similar to it online. All I found is that the legs are windsor style. I’m unsure as to how old it is, or if the ugly brown fabric was original. I’m guessing the bench is pretty old because of the burlap, the types of nails, and the heavy cotton stuffing that was inside. To recover the bench, I first took off the old fabric and kept it for my template. Then I cut a piece of polyester batting and the fabric using that template (I kept the old batting, but used the polyester to make sure all of the wood has softness). I first made sure how I wanted the fabric’s pattern to look before cutting it. 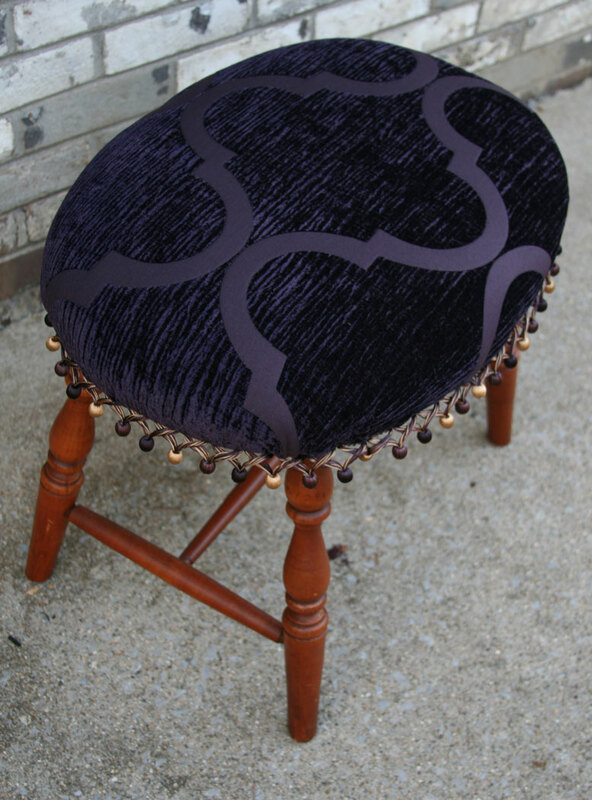 I then used a staple gun and pulling very tighly on the fabric, I stapled it to the bottom of the bench. I stapled the fabric to the bench in an opposite pattern (working North/South, then East/West), to make sure the tension in the fabric was tight. I have the Stanley TR45 Staple Gun off Amazon for $12, which has been awesome. It even comes with a carrying case. Then I went back and stapled the trim. I put the band of the trim underneath the stool so you wouldn’t see it, or the staples. I can’t remember exactly how I much I paid for the bench, but I think it was maybe $10 at Restore. I used $9 worth of fabric and $11 in trim. I got these at Hancock Fabrics.